A lunar landscape scene captured from the Cumeada Observatory in Portugal's Dark Sky Alqueva Reserve shows the impact craters of Aristoteles, Eudoxus, Aristillus and Autolycus. Miguel Claro is a professional photographer, author and science communicator based in Lisbon, Portugal, who creates spectacular images of the night sky. As a European Southern Observatory photo ambassador, a member of The World At Night and the official astrophotographer of the Dark Sky Alqueva Reserve, he specializes in astronomical skyscapes that connect Earth and the night sky. 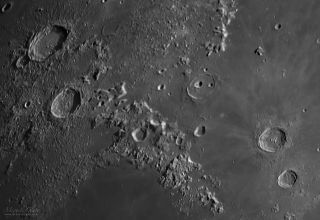 Join Miguel here as he takes us through his photograph "Flying Over the Moon Crater Aristoteles and Rimae of Theaetetus." This moonscape scene shows a cluster of impact craters on the moon. I captured this high-resolution image from the Cumeada Observatory, headquarters of the Dark Sky Alqueva Reserve in Portugal, using a Celestron C14 EdgeHD XLT telescope with aZWO ASI174MC astrophotography camera. An annotated version of the photo shows the locations of the impact craters and rilles on the moon. Immediately south of Aristoteles lies the slightly smaller crater, Eudoxus, measuring 41 miles (67 km) across. Almost centered in the photo is the Cassini crater,which contains two small craters known as Cassini A and Cassini B. The little craters are only 9 miles (15 km) and 6 miles (9 km) wide, while the diameter of the larger crater is about 35 miles (57 km). From the bottom center to the low edge of the image, two main rilles, or shallow grooves, are visible. One, known as Rima Calippus, measures 12 miles (20 km) long. The other, Rimae Theaetetus, has a length of 16 miles (25 km). On the right side, we can see two more large craters, Aristillus, with a diameter of 34 miles (55 km), and below it, the crater of Autolycus, with a diameter of 24 miles (39 km). To see more of Claro's amazing astrophotography, visit his website, www.miguelclaro.com. Follow us @Spacedotcom, Facebook and Google+. Original article on Space.com.